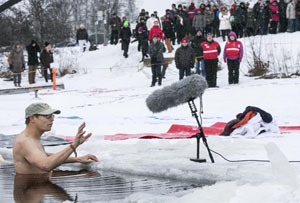 That's what the crazy Finnish wannabe entrepreneurs who attend the annual Polar Bear Pitchfest in Oulu have to do to prove they are hungry enough - endure trial by (cold) water. The Polar Bear Pitchfest is an annual event involving dozens of cash-strapped start-up hopefuls descending on the lake-rich northern Finnish city of Oulu, wearing little more than their swimming costumes and ready to take to the freezing waters in order to prove their worth. And Oulu is only 100 or so miles south of the Arctic Circle, so you can bet that it is going to be REALLY cold. They sound like exactly the kind of enterprising and hardy souls that MT’ers would like to know more about, so we’ve teamed up with our new friends at business video channel Btube to bring you some footage. And if you like it, all the better - today’s clip is just a taster, there’ll be lots more from the Polar Bear Pitchfest next week.